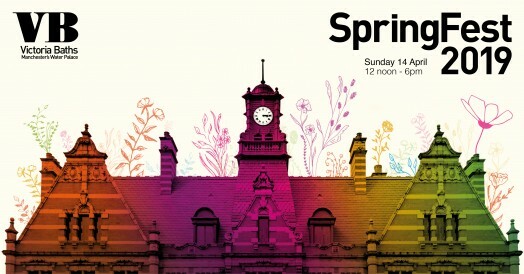 Victoria Baths is throwing its doors open to visitors for SpringFest, a fantastic celebration of music and art. Visitors will have the chance not only to explore the building but also to enjoy a fabulous line-up of artists and musicians thoughout the day. Fun baking competition for all ages (3 age categories) with prizes for the winners. £5 entry fee (includes entrance to SpringFest for the day). Click on Link below for full details and/or to enter. We'll have food stalls to feed the hungry and our Bar will be serving tea, coffee, soft drinks and alcohol all day long. A series of Guided Tours (see details below) will be available on the day (book in advance or pay on the door. Numbers are limited and sold on a first-come-first-served basis. Discover Victoria Baths shows you the amazing architecture of the building and its history. Hear how the building was used, including memories of its bathers, plus find out about the 2003 BBC Restoration win and how the money was spent. We'll also tell you the plans for the future and how you can get involved. Off Limits* takes you to lesser known parts of the building Baths as well as the main iconic spaces. You will visit the boiler house and filter room and hear about pool water treatment through the ages. The tour visits the undercroft of the pools and several spaces that have been used for TV filming, including Peaky Blinders and Life on Mars. * Please note that this tour involve stairs and uneven floors and so isn't suitable for visitors with limited mobility. Note: there will be a videographer and photographer at this event.